Extra deep lap tray's easy grip side handles provide a firm hold. Dishwasher safe, 18" x 12 1/4" plastic food lap tray has room to hold everything for meals including beverage, utensils and napkin. Enjoy a meal anywhere in your home. Lap tray doubles as a portable craft and hobby tray. I bought this tray for my mom, and she really likes it. The extra depth is nice, it is easy to clean, it is lightweight, and the handles provide for a sure grip. I have used this tray whenever I have a meal r snack in my easy chair. The deep sides prevent things from falling off the tray. I've also used it in bed as a flat surface to organize my medications..no more lost pills! This tray is well made and easy to clean. don't have a dining table, so these work perfect. Since my husband has a neurological disease and he has difficulty holding onto things with his right hand, this product allows him to watch tv when eating. This keeps his plate from slipping around. The plate fits snuggly into the tray and doesn't move. This lap tray is exactly what I needed. The lip keeps things from slipping off. Perfect size. i love this tray. i have been looking for something like for years. i purchased one for both my husband and myself. love the built in handles and they stack so they don't take up much space. I love this tray ! I love the deepness of it and the handles. I also love that it is made of like a rubber made material and not tin.It's also easy to wash. I have 5 no,, for the whole family. I give it 5 stars. I could not be happier with this tray. Currently I use it for dice games (no more dice on the floor) and sorting mail, and I plan to use it for crafting. Because of the one reviewer who said dinner plates didn't fit, I did test it out. It will hold my 10" dinner plate, a coffee mug, utensils, and a napkin. In a pinch, I can also put a very small bowl or saucer on it, but then it gets crowded. I really wish I had had this when I was recovering from surgery. I'm seriously thinking about buying a second one. This is a great and helpful product. I am glad I found this product for my husband. His meals are firmly balanced on his lap without the chance of unbalanced spills. He really likes that. Thanks! Great - better than any type of tray previously used. Very stable. I have used metal and wood trays in the past, but this model is lighter and more durable. My elderly (92) mother uses the tray regularly and with ease. Bad Boy Bugler from back in the day! I bought two trays because my husband and I like to eat sometimes in front of the television. We were using regular trays and they didn't work. These are fantastic! They don't slide on your lap, they are easy to clean, and perfect for every day use. Love them! this a great tool for eating alone or with a friend. i have tried tv trays and they are bulky and take up too much space. I bought this for my Mom and it works really great for her. Next purchase a non slip tumbler. These trays are perfect in size and weight. And they stack great too. I really love them. I had one and bought another for a friend recovering from surgery. I wish it had a small indent for a drink..but I do love the high sides. Great to use when eating in your chair or bed. Lightweight but sturdy. Fits any size lap. I BROUGHT ONE, BUT LATER I BOUGHT FOUR MORE. LAST YEAR I TRIED TO GET FOUR MORE BUT WD HAD RUN OUT OF STOCK. SO I CHECKED AGAIN AND I SEE THEY ARE BACK SO I ORDERED FOUR MORE. KEEPING MY FINGERS CROSS I CAN GET THESE THIS TIME. Just what I needed to use for a TV tray in my recliner. Good quality and arrived in the shipping time promised. I will surely be a regular customer of this seller. This tray is very useful for many reasons. Dinner tray, holds my laptop well because it is deep enough and it is very sturdy, can use as a serving tray or on coffee table with snacks. Love it. I ordered this lap tray for my mother. She had just gotten out the hospital and was very weak. This tray allowed her to take her time and eat and not have to hold things too long. It works great...much easier to eat and drive now. I just the easy handles and the deepness of the tray.Thank you. I bought the tray for my Mom,she is in a wheelchair or recliner. She loves the tray and tells me dishes and her coffee mug stay put. She uses it daily. I live in someone else s house. I like to take snacks in my bedroom to use by my chair or on my bed need tray so crumbs do not get on either. It is a little bigger than I expected or wanted but it is still useful. I also use it is to carry snacks to the porch and to the pool. It is light, easy to clean and store. I like it being deeper when I am carrying things. The lap tray comes in handy when sitting in my lounge chair eating and watching TV. It also comes in handy when I need to refill my weekly pill container. It also makes it easy for me to carry my food from the kitchen to the living room. I do wish that it had a place designed to put one's cup. 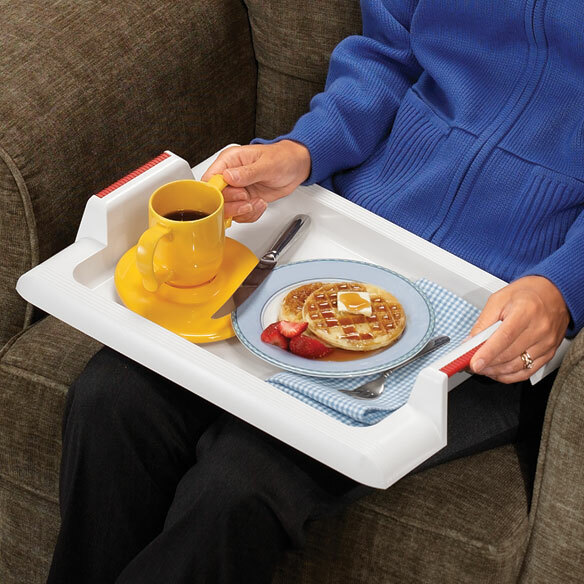 These trays are great for carrying food and for setting on your lap to eat dinner while watching TV. Nice size and steady on lap. I bought two and they fit into one another well for space- saving storage in kitchen cabinet. Convenient and easy to clean! I like the style and fact that it is light weight. It is too large to hold on my lap to eat from. I have this product. Use it every day. When my daughter got married, she took my trays. I couldn't wait to replace them. As long as this product is available I will have it. I love shopping at Walter Drake. Hubbys wooden tray died and he never eats at table. (must have tv) The only con is it does need short fold in legs so it dont slide on his lap and i did have to put nonslide cabinet liner on it so plates dont slide. I love the good grip on handles, so special for my arthritic hands. The design is pretty good, but it would be much better, it there were something to keep it stable on your lap, like a bean bag bottom or somthing. According to the description and the picture the item should have a room for beverage and meals. There is no beverage holder or any room for a drink!!!! This is just a plain tray with room for one plate only!!! Well, you can find a space for a napkin, if you have a desire for it. I am very disappointed! There is just my husband and myself in our home and for the two of us it just seemed better with the trays for our eating purposes. I don't need or want to have to set the table for 2 of us. I was thrilled when I saw the tray in the catalog, I thought ah, perfect for us. Thanks guys. Like the deep tray to catch spills. need one . I have a brother in a chair that could use it. The tray look like something we can use everyday at home. easy to use. very versatile. be good to use if you want a snack or to sit in your favorite chair instead of at table. lap (18"wide x 12") and deep enough that you won't be dumping contents of tray on the floor/lap/chair. Nice looking handles too. Should hold many sizes of books or tablets to read from. We often eat in the play room. This will come in handy. The tray I had was flat and my dishes slid off. I like the lip around this one. I hope this makes it easier when in my easy chair watching TV. Supper in front of tv!!! These will come in handy... $4 off if you buy 2! They look sturdy and easy to handle. keep the mess down with the kids. Bought one and liked it. Just ordered three more. Very light and plenty big enough to hold a dinner plate. I like the color and design. Because it could contain any spills and seemed stable with the ability to hang onto the handles. I chose the deep lap tray for the safety it provides with the deep sides and the low price. Some of the craft work that I do involves some very small items and this tray has a high ridge on it. This would work great so items do not slide off. To eat comfortably while sitting on the couch while watching TV. My mom can hold it better when she eats, she has trouble holding onto things with her fingers sometimes. Need 2 reliable lap tables. We are senior citizens who eat on trays nightly. These are light-weight, sturdy, and easily manageable for us. I chose this lap tray because it is deep. It will help keep my husbands ice cream and snacks from falling in his lap. Lightweight, ample room, sturdy handles and deep sides to avoid accidents. Mom sometimes like to eat in the living room while watching TV. Liked the support. My husband and I sometimes eat in the living room. This will keep everything neat and in place without making a mess. what does the inside of the rim measure? BEST ANSWER: Thank you for your question. 14 ½”long x 9 1/2”wide x 1”deep. We hope this information will be of help to you. Is this tray suitable as a wheelchair tray? Will it fit between the arms of a wheelchair? BEST ANSWER: The overall length of the tray including handles is a little over 18 inches. If it will fit between the arms is a matter of wheelchair size, but I would guess it would fit a standard chair. I researched a bit and found that seat width varies from 14” to 24” depending on patient size and weight. I have never needed to use it with a wheelchair as it fits nicely with my recliner. Better to measure before you order. This tray will sit comfortably in your lap and between wheelchair arms. What SPECIFIC material/plastic is this made of - Polypropylene, Polyethylene, etc.? And is the material thick, sturdy? BEST ANSWER: Thank you for your question. It is made of Polypropylene Plastic and is BPA free. We hope this information will be of help to you. It'very sturdy. Dishwasher ok. Have no idea what type of plastic it's made of, sorry. Is the tray padded or cushioned underneath to offset any heat burning the legs/lap that may be on plates, etc.? A large number of foods are now heated by MW and MWs generate heat as well as conventional ovens. BEST ANSWER: Thank you for your question. Unfortunately this item is not padded. We hope this information will be of help to you. Will it fit on top of the side rails of a walker? Where the handle is, are the curled sides underneath at least 1 inch wide? BEST ANSWER: Thank you for your question. No, we suggest you look at item 303423, the walker tray. We hope this information will be of help to you.